Especially in the field of oncology, the discovery of biomarkers is rapidly advancing, including the development of companion molecular diagnostics, which identify whether a specific biomarker is expressed on patients’ tumors. Interest in developing companion diagnostics for targeted therapeutics has been fueled by the FDA’s support of these tests, as shown by the recent approval of two such targeted therapeutics—vemurafenib (Zelboraf) for metastatic melanoma and crizotinib (Xalkori) for late-stage non–small-cell lung cancer—with their corresponding companion diagnostics within the same month in 2011. While companion diagnostics often are based on genetic markers found in histological samples, companion imaging diagnostics that noninvasively identify biomarkers have advantages that may benefit patient treatment. 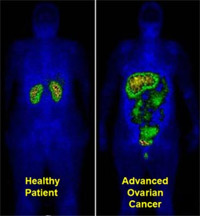 Companion imaging diagnostics that enable whole-body imaging to assess a tumor in real time are important, as biomarkers in metastatic sites can vary and change over time. Current approaches in this area mainly focus on antibody-based PET and SPECT imaging combined with different radioisotopes to balance the physical half-life of the radioisotope with the pharmacokinetic half-life of the antibody. While an antibody-based approach is promising, one hindrance of its use for in vivo diagnostics is the inherently slow pharmacokinetics profile; antibodies may require days to reach the optimal biodistribution. A potential approach that overcomes this limitation is the use of small molecules conjugated to a radioisotope, which confers an improved pharmacokinetics profile. 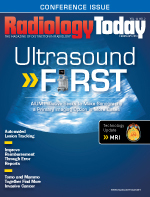 One example of a companion imaging diagnostic in late-stage development is etarfolatide, which is a folate-targeted molecular radiodiagnostic imaging agent that identifies tumors that overexpress the folate receptor. Clinical data have shown that patients with metastases that are all positive for the folate receptor, identified by etarfolatide, benefited the most from the treatment with vintafolide, the corresponding folate-targeted small molecule drug conjugate. In addition, this approach provides a paradigm for the codevelopment of a diagnostic and therapeutic agent, according to the FDA guidance on personalized medicine. The increasing interest in developing targeted therapies has created a need for companion diagnostics, including noninvasive imaging companion diagnostics, which potentially confer treatment advantages that ultimately benefit patients as well as the healthcare system overall. — Phillip H. Kuo, MD, PhD, is an associate professor of medical imaging, medicine, and biomedical engineering; section chief of nuclear medicine; and director of PET/CT at the University of Arizona Cancer Center. Etarfolatide is comprised of the targeting ligand folic acid (yellow), which has a high folate receptor binding affinity, and a Technetium-99m–based radioimaging agent (turquoise). 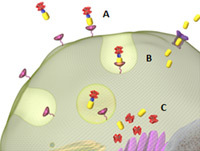 Etarfolatide identifies metastases that express the folate receptor protein in real time (A). The folic acid-targeting ligand is identical to that found on vintafolide, the corresponding therapeutic small molecule drug conjugate, which also contains a linker system (blue) and a potent chemotherapeutic drug (red) (B). Diagnostic images of whole-body scans obtained following administration of the targeted radioimaging agent 111In-DTPA-folate, which is constructed with the same folic acid ligand as that engineered in etarfolatide. The healthy patient image on the left shows no folate receptor-positive abdominal tumor. Instead, only healthy kidneys (involved in excretion) are revealed. The patient on the right shows folate receptor-positive tumors in the abdomen and pelvis. Patients with metastases, identified with the companion imaging diagnostic etarfolatide as folate receptor-positive are most likely to respond to treatment with the corresponding small molecular drug conjugate vintafolide. Note: Vintafolide currently is being evaluated in a phase 3 clinical trial for platinum-resistant ovarian cancer and a phase 2 trial for non–small-cell lung cancer. Both studies also are using etarfolatide. Folate is required for cell division, and rapidly dividing cancer cells often express folate receptors to capture enough folate to support rapid cell growth. Elevated expression of the folate receptor occurs in many human malignancies, especially when associated with aggressively growing cancers. The folate-targeted small molecule drug conjugate vintafolide binds to the folate receptor (A) and subsequently is internalized by a natural endocytosis process (B). Once inside the cell, vintafolide’s serum-stable linker selectively releases a potent vinca alkaloid compound (C) to arrest cell division and induce cell death. Deri MA, Zeglis BM, Francesconi LC, Lewis JS. PET imaging with (89)Zr: from radiochemistry to the clinic. Nucl Med Biol. 2013;40(1):3-14. Crippa F, Alessi A, Serafini GL. PET with radiolabeled aminoacid. Q J Nucl Med Mol Imaging. 2012;56(2):151-162. Kalia M. Personalized oncology: recent advances and future challenges. Metabolism. 2013;62 Suppl 1:S11-S14. Dosio F, Milla P, Cattel L. EC-145, a folate-targeted Vinca alkaloid conjugate for the potential treatment of folate receptor-expressing cancers. Curr Opin Investig Drugs. 2010;11(12):1424-1433. Pribble P, Edelman MJ. EC145: a novel targeted agent for adenocarcinoma of the lung. Expert Opin Investig Drugs. 2012;21(5):755-761. Leamon CP. Folate-targeted drug strategies for the treatment of cancer. Curr Opin Investig Drugs. 2008;9(12):1277-1286.